We have received our latest update from Jefrianus. Jefrianus celebrated his 12th birthday on January 5th. His family are well and they have moved house. His family's home is now constructed of metal materials. Jefrianus continues to attend primary school which is almost 30 minutes away. His favourite activity is languages. Their main source of water is now a well which is up to an hour away and this is considered to be an improvement on their previous source of water from a spring. In the area where Jefrianus lives Plan have helped to provide play equipment for school children. Please continue to donate to the Golden Jar collection so we can make a difference to the life of Jefrianus and his friends. Thank you for all your donations during the school year 2015 - 2016. We collected £57.05 plus another £30 which was donated by the audience of the Year 3/4 assembly - Children in Other Countries. Thank you to everyone who has put pennies in the Golden Jar during January. We have collected a total of £28.39 this month. 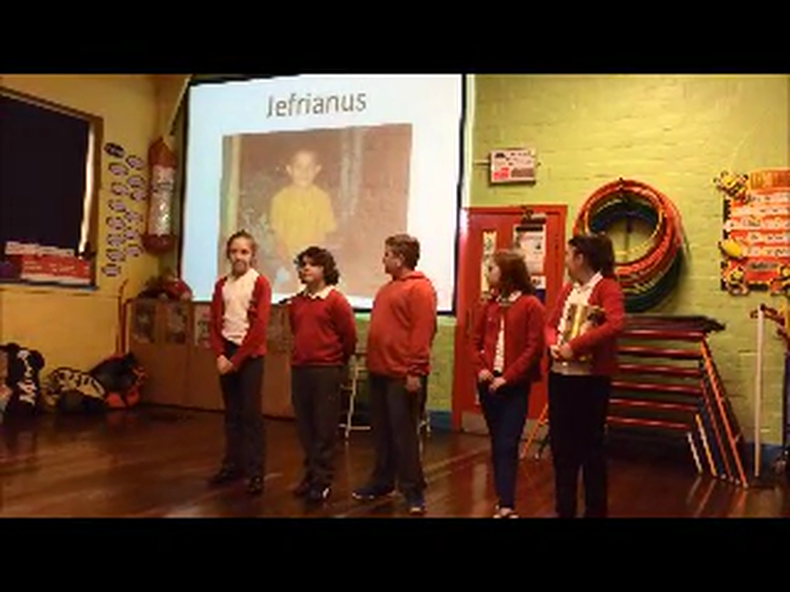 The Year 5/6 Eco Representatives present an assembly about Jefrianus..